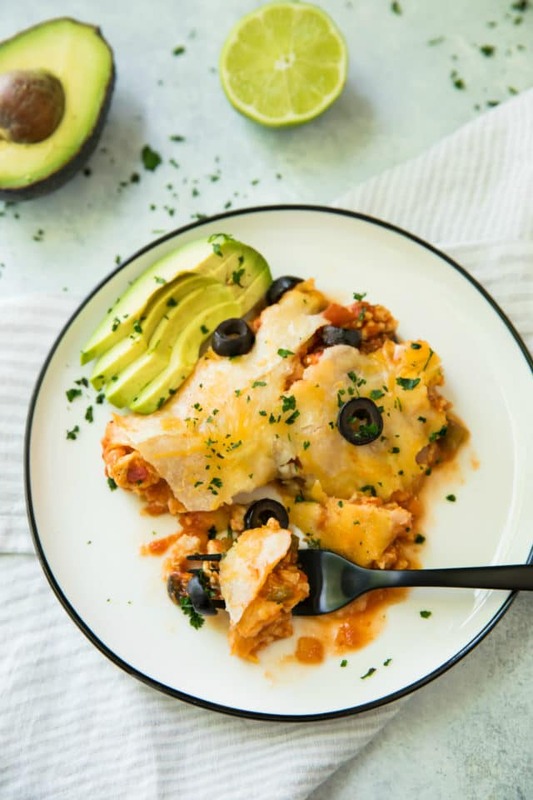 Tasty, easy 5 Ingredient Slow Cooker Taco Bake. Just set it and forget it for a cheesy, protein-packed meal the whole family will love! Made deliciously gluten free with Mission® Gluten Free Soft Taco Tortillas. Sometimes (read: pretty much every day of my life) I need an easy, practically zero-work recipe that I know I can count on to be absolutely 100% delicious to feed my Mexican food obsession. 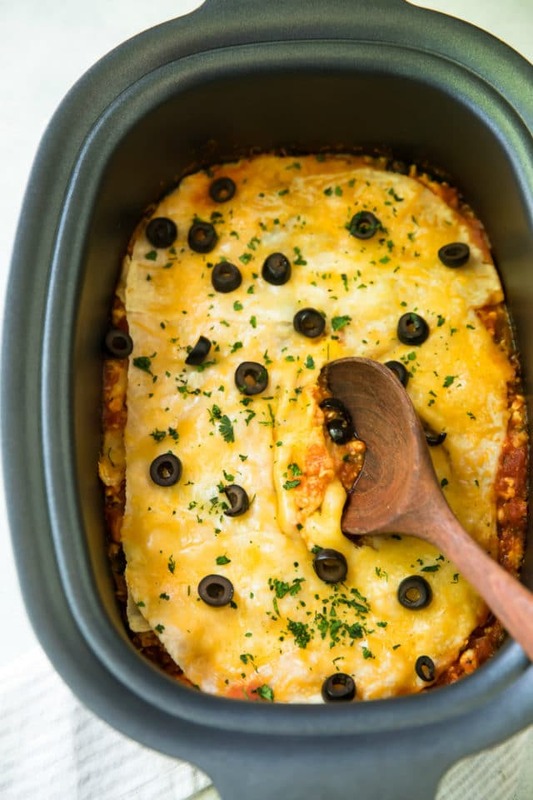 5 Ingredient Slow Cooker Taco Bake, you are heaven sent. Literally five minutes of prep means I can forget it for a few hours and come back when it’s ready to be devoured. 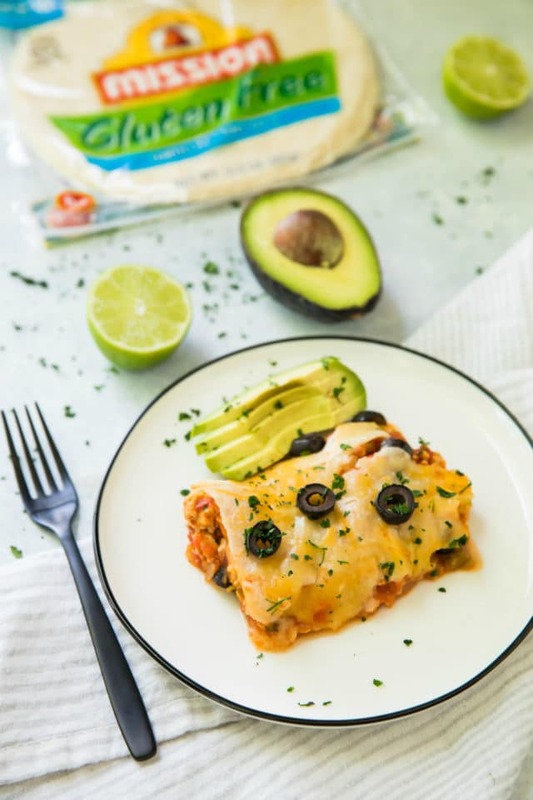 This deliciousness is also gluten free, made with Mission® Gluten Free Soft Taco Tortillas, so it’ll feed any guests or family members that are living a gluten free lifestyle or have a dietary restriction. Mission Gluten Free Soft Taco Tortillas are certified gluten free and they’re non trans-fat with zero cholesterol. They’ve been my go-to for everything from wraps to quesadillas and definitely for tacos. It makes me so happy that my son, while still adhering to his gluten free diet, can enjoy all of his favorite foods and Mexican dishes. With the help of Mission Gluten Free Soft Taco Tortillas, we do not need to sacrifice flavor! These Mission Gluten Free Soft Taco Tortillas have been a game changer for our family. 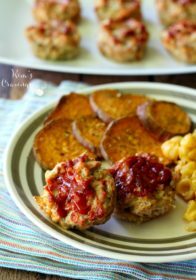 We all love the softness and flavor they have and my son can enjoy all of the same meals that the rest of the family is eating. 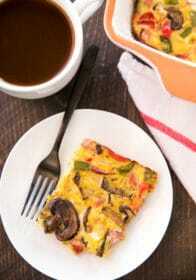 Visit the Mission Gluten Free homepage for more delicious recipes and inspiration. You can also use the store locator to find products in your area. They’re available nationwide and can be found in the tortilla section or the gluten free section of the store. I appreciate this Easy Taco Bake for its simplicity and crowd-pleasing tastiness. My kids love a good Mexican dish, so I knew this dinner would go over well. A lot of meals can be overly fussy and complicated… not this one! It will be a family staple that I’ll be making again and again. It freezes great too! Give this meal a try on a busy weeknight or a weekend when you definitely don’t want to be in the kitchen all day. 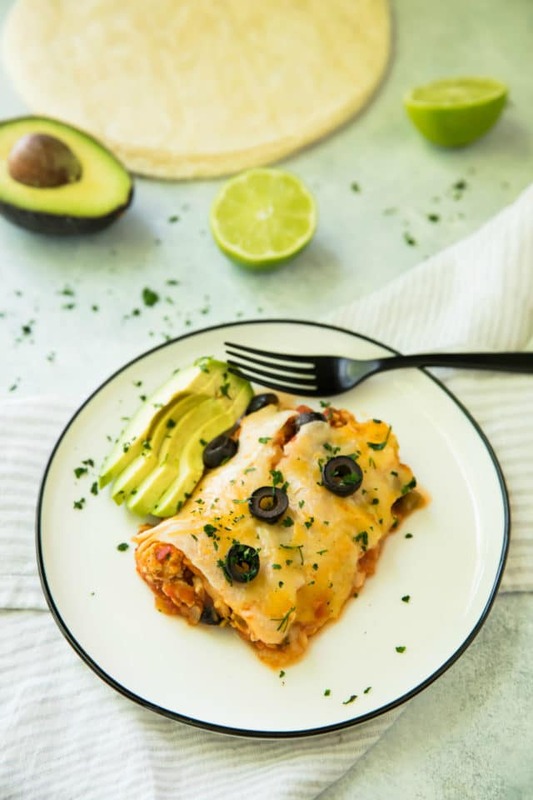 This 5 Ingredient Slow Cooker Taco Bake is gluten free, clean eating, and incredibly quick and easy to prepare. 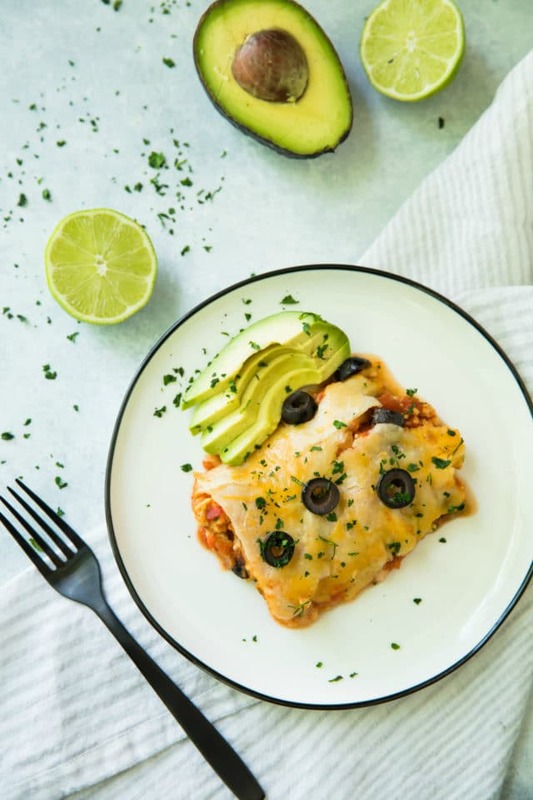 This complete meal is sure to be a hit with your entire family! Brown ground turkey in a medium skillet at medium to high heat. 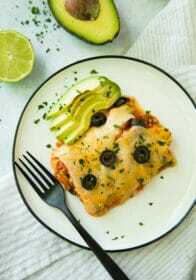 Cut one tortilla into strips and add the tortilla strips along with the enchilada sauce, 1/2 cup cheese and 1/2 of the olives to the browned meat. Stir to combine. Add the mixture to a slow cooker. Top with another couple of tortillas, the remaining cheese and olives on top. Cover and cook on high for 4 hours, or on low for 8 hours. 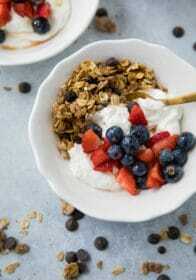 Enjoy with a dollop of Greek yogurt, light sour cream, guacamole or avocado slices, if desired! 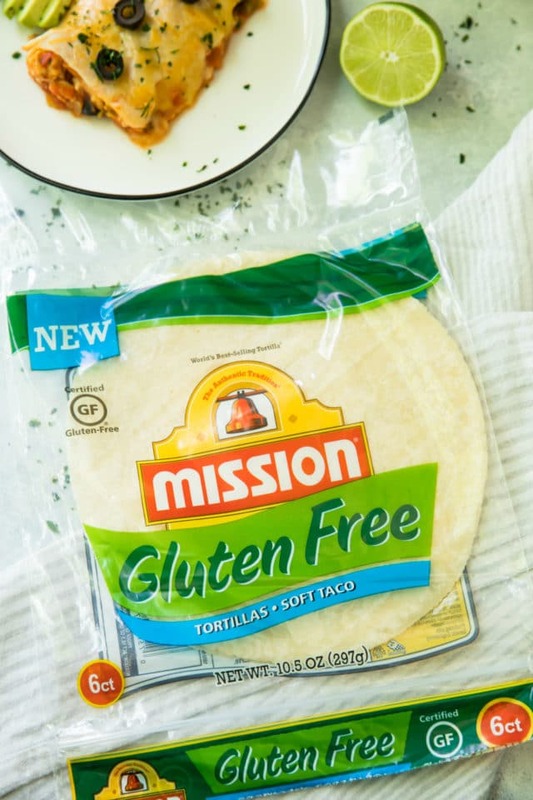 Have you tried Mission Gluten Free Soft Taco Tortillas? What are you waiting for?! They’re fabulous! Now is when I wish I could eat a Mexican dish. 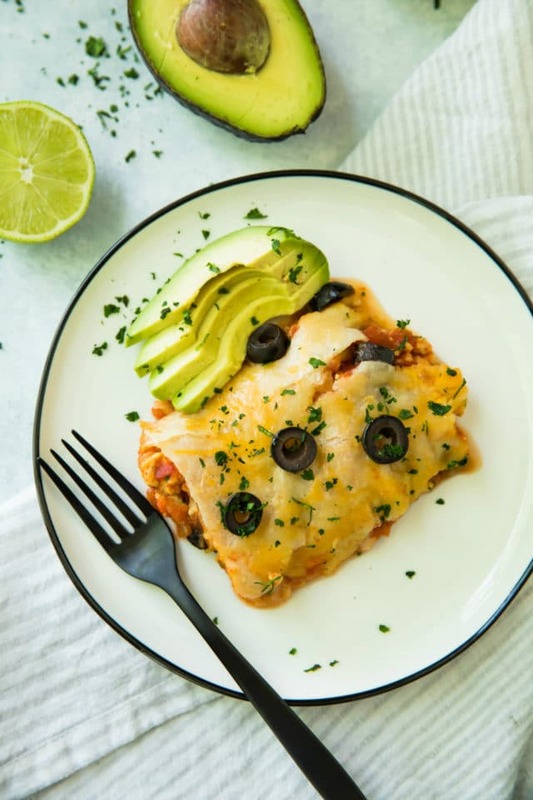 I mean, these taco tortillas look very delicious and I’m loving how you serve it with avocado slices…that even makes it look more scrumptious! Yum! I am all about Mexican food, so I’ll be trying this. I’d just have to leave off the olives. I can’t do olives. I too would leave off the olives. Also I wish she would show how she sliced the tortillas and built everything in the slow cooker. That would help. I just simply tore the tortillas and layered, nothing fancy at all. Hope you get a chance to give it a try! Your pics are making it look so irresistible. 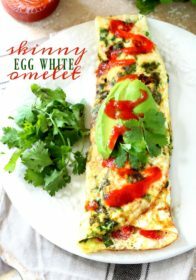 Loves the ingredients and ease, plus I love avocado. Oh this looks amazing! We’ll have to give this a try! OK now how simple is this, I am loving that it is only five ingredients as I am not the best cook and need things to be simple! Um…I absolutely love any recipe I can make in my crock-pot!! This is so unique as it’s not the typical stew, soup, etc. made in a crock-pot. So simple, yum! I need to do more with my slow cooker because it’s really going to help me on busy nights! I think it’s awesome that you’re sharing this really easy recipe! It looks so good too! Who doesn’t want a taco bake! YUM! I wish I had a slow cooker. I like to watch at recipes that involve one to be able to make that step. This one is a great one, sounds so delish. Loves the ingredients and ease. Your pics are making my mouth watering. Looks really amazing. I love tacos but have never even considered using a slow cooker to make them! Need to try this method! Yum! This taco bake looks incredible!! I love how versatile slow cookers are, you can make anything in them! This looks so good! I’m glad to see that the gluten free tortillas hold up. When you cook gluten free pasta for a long time, some brands completely disintegrate. Glad it’s not the same with the tortillas! oh this taco bake looks so good! Love to have a plate of that right now actually. I’m thrilled mission has come out with a gluten free tortilla…i know friends will appreciate a gluten free alternative. This is so easy and fast to throw together – it would make a great work night meal. Just pop it together in the morning and come home to a delicious meal at the end of the day! Kim, these are my favorite gluten-free tortilla’s! 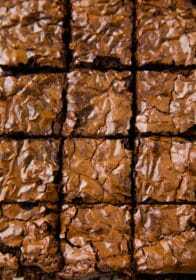 This recipe looks absolutely delicious and so easy! It makes 8, 1 cup servings. I hate canned enchilada sauce!! !